Photos on balloons are a great way to convey a message or emotion to its viewer. Anytime you see a balloon it seems to bring out a smile and happy memory. Many times a balloon is thought of as a party decoration, but it can be much more than that. Why do people use balloons in the first place? It’s usually to bring attention to something or someone. In a business setting, balloons can indicate a grand opening or a big sale. Balloons can say a lot just by looking at them. Sometimes there are words imprinted on the balloon to display a very specific message. If you entered a car dealership and saw a balloon that said, “Get Free Maintenance With Every Purchase”, would you be interested? You probably would be. Plus, you didn’t even hear that message from a salesperson. One simple phrase on a balloon already brought you one step closer to making a purchase. Now imagine the possibilities by placing photos on balloons. Sometimes images can speak volumes without the use of words. Here’s an idea; your son is having a graduation party and you’re in charge of decorations. Why not line the entry into your home with a balloon timeline of his life. Each balloon can have a photo image of your son from infancy to teenage years. As your guests walk through, they’ll be presented with photos at the different stages of the proud graduates life. No words are necessary. If you’re a business looking to promote a product or sale, you can use the same ideas for your customers. It’s all about creativity and having fun. Sometimes just one single thing that stands out in a customer’s mind will be all you need to close a sale. If you can differentiate yourself from the competition, then you may directly profit from that. 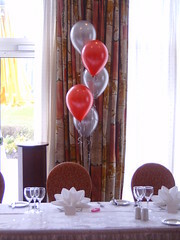 Something as simple as photos on ballons can be a factor that makes a customer remember you over the competition. ← Previous Previous post: Do You Cover Ireland?